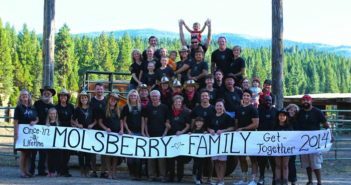 The Jessup family hosts at Sylvan Dale Guest Ranch in Loveland, Colorado, planted an apple tree for Carl and Judy Nemecek’s 40th wedding anniversary. Family reunions at Sylvan Dale hold a special place for the Nemeceks, who not only met at the ranch in the late ‘50s but got married there. Why an apple tree? Well, Carl tossed apples at the window of Judy’s Sylvan Dale cabin to get her attention at that first meeting, thus beginning the first of many ranch reunions. 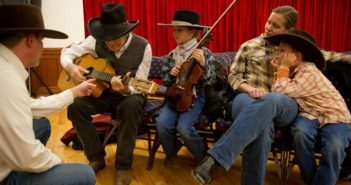 Folks like the Nemeceks return to Sylvan Dale year after year not only for the fresh mountain air, horseback rides and fly fishing, but the special “gathering” rooms set aside for reunions. Sylvan Dale is clearly legendary for creating lifelong memories. Families or groups receive a hand carved wooden name plaque upon arrival to identify their gathering area. Many leave it hanging in anticipation of their next reunion. Sylvan Dale is described as a unique and heart warming reunion site. 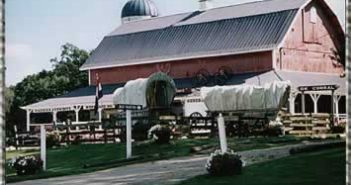 The 3200 acre, secluded site offers dude ranching and cattle drives all summer and an array of year ‘round activities for all ages. Contact 877-667-3999; www.sylvandale.com.